Indisputably one of the world's most impressive natural sights, Niagara Falls straddle the United States/Canada border, marking the spot at which a thundering river plunges over a major escarpment. 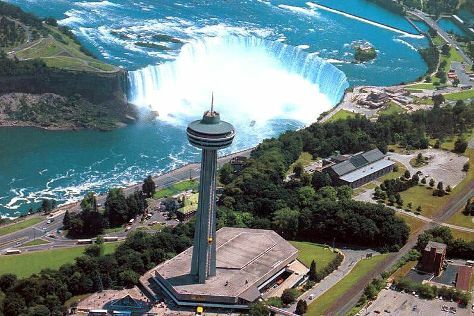 A Niagara Falls vacation allows you to view one waterfall on the Canadian side and two on the American, which combine to form one of the most powerful flowing bodies of water on the planet. Most visitors on a Niagara Falls tour appreciate this breathtaking natural spectacle by taking a boat tour from the base of the Horseshoe Falls. Away from the water, the town often seems a bit tacky, featuring a string of hotels and casinos that seem to draw mostly strapped-for-cash honeymooners. Niagara Falls is in Ontario. Our Canada vacation maker app allows you to schedule your trip to Niagara Falls, learn about its attractions, and find out about where else to go during your holiday. The city bordering Canada's most famous attraction offers a wide range of accommodations, with competition keeping prices surprisingly low. You'll pay a premium for views of the falls, with most of the prime real estate right by the star attraction controlled by major international hotel chains. Most sit along Niagara Parkway, which fronts the river. If you're looking for something nearby but still affordable, check the options along Victoria Avenue--you won't have a view of the falls, but you'll be just minutes from the spectacular attraction.